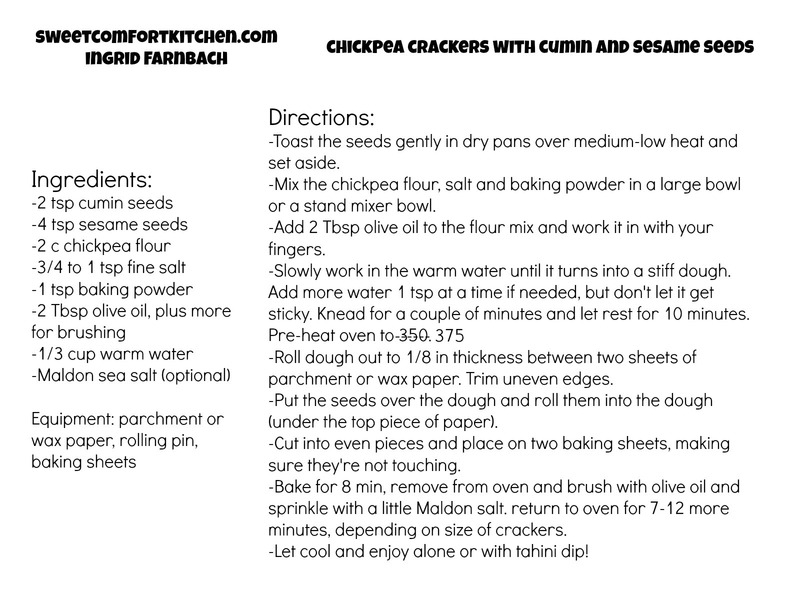 My obsession with chickpea/garbanzo flour continues! It can't do everything wheat flour can do, but it's fun to check out the possibilities while I'm avoiding things that trigger cravings. I took these to my friends' annual warm, wonderful Valentine's Dinner to rave reviews! Also called gram flour (not graham), besan flour, or garbanzo flour, you can find it at a good market with a bulk section or in packages with the alternative flours. As a last resort, it's available online. 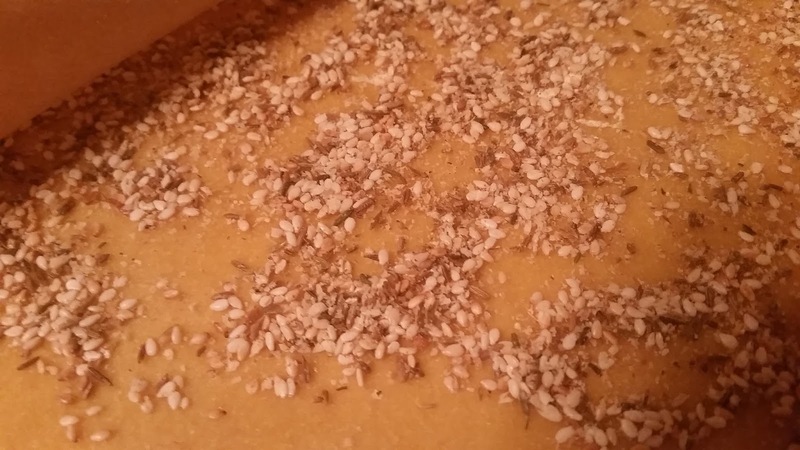 I've adapted these from Dolly and Oatmeal, changing up the spices because I don't love za'atar. You can make them your own with other spices...if you use ground, blend them into the dough rather than pressing them on top. 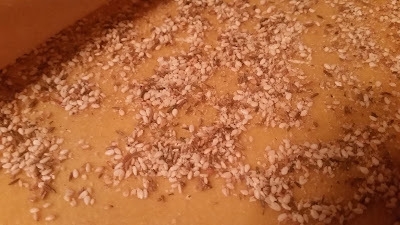 First, toast 2 tsp cumin seeds and 4 tsp sesame seeds. Put them in small dry pans over medium-low heat. 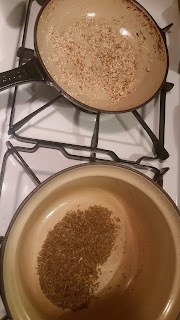 For the sesame seeds, toast until they just start turning brown, stirring often, and then turn off the heat and let them brown a little more on the residual heat. 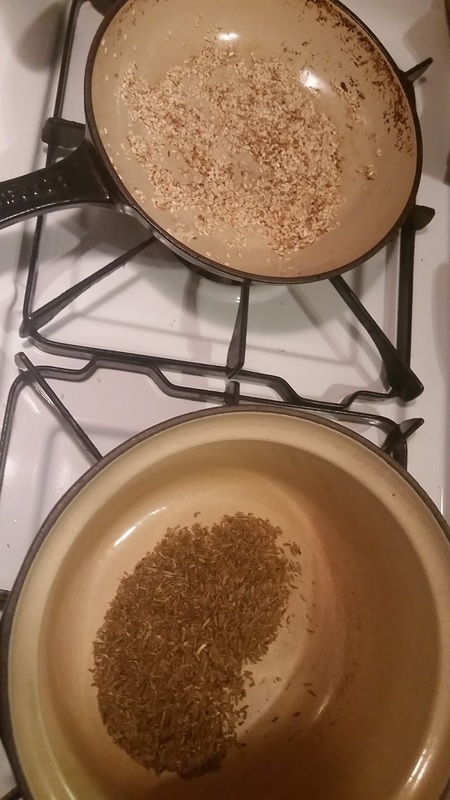 For the cumin seeds, toast until you can smell the toasting cumin from a couple of feet away, then also turn off the heat and let them finish in the warm pan. 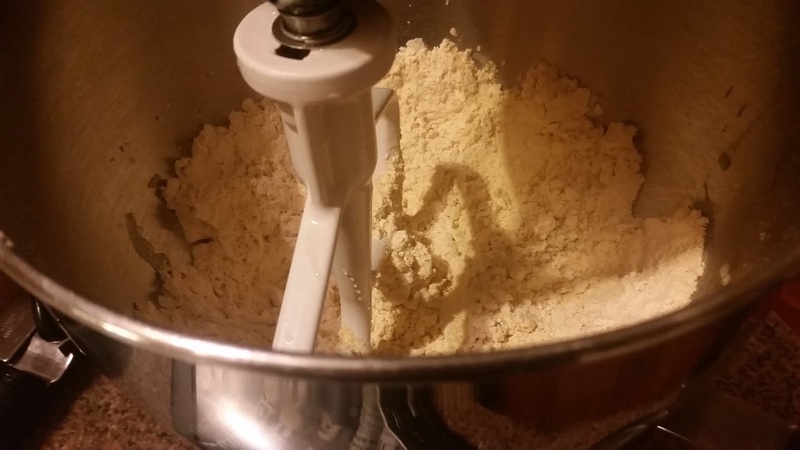 Put 2 cups chickpea flour, 3/4 tsp fine salt, and 1 tsp baking powder in a large bowl or the bowl of a stand mixer. Mix well. If you're not planning to use Maldon salt later (see below), bump up the salt to 1 tsp. Add 2 Tbsp olive oil and mix in with your fingers until evenly distributed. Have fun getting your hands messy! With the paddle from the stand mixer or a wooden spoon, stir the flour quickly while you slowly add 1/3 cup warm water until it turns into a stiff dough. If it isn't holding together, add more water 1 teaspoon at a time. Don't let it get sticky, or you won't be able to roll it out and put the pieces on the pans. One test batch ended up in the trash for this reason. Sadness. Turn out the dough onto a board or a piece of parchment paper and knead for a minute or two to make sure the ingredients come together. 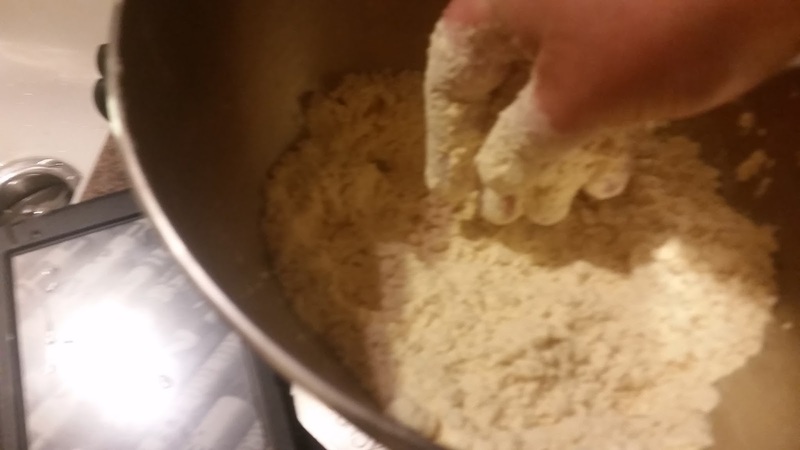 Put a bowl over the dough and let it rest for ten minutes. Turn on the oven to 350 Update: 375 to pre-heat while the dough rests. 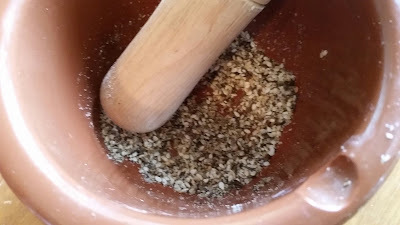 If you have a mortar and pestle or a spice grinder, put the seeds in it and break them up a little. If you don't, no problem. Put the dough between two pieces of parchment paper and use a rolling pin to roll it out to about 1/8 in thickness. 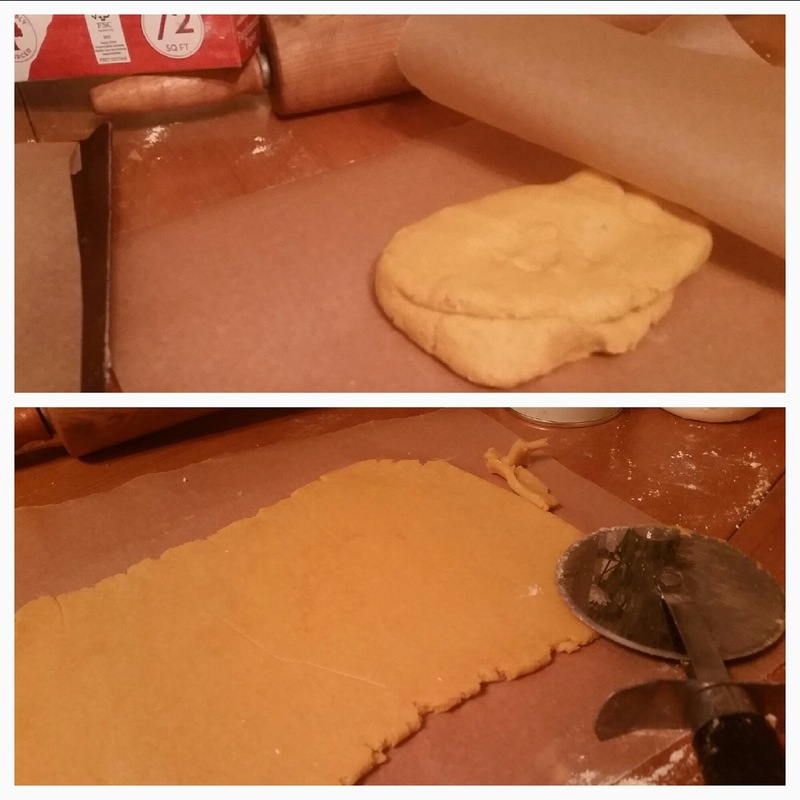 The more evenly you roll it out, the more evenly the crackers will bake. Trim the edges with a knife or a pizza cutter. You can roll that out again later. 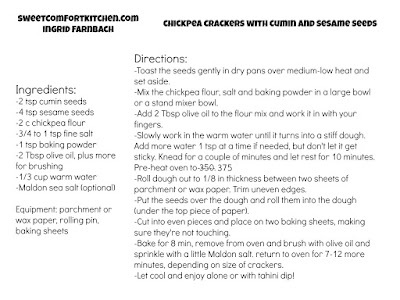 Put the seeds on top of the dough and put the top piece of parchment paper back on. Roll the seeds into the dough so they stay in there instead of coming off. 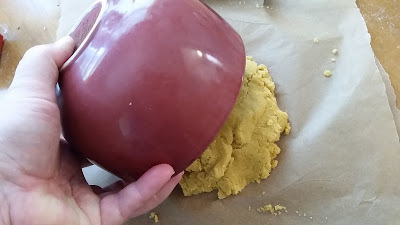 Trim the uneven edges again and cut the dough into whatever size pieces you want, making them as even as possible so they bake evenly. I guess I should get a ruler for this kind of thing, but hey, life isn't perfect, so my crackers don't have to be, either! 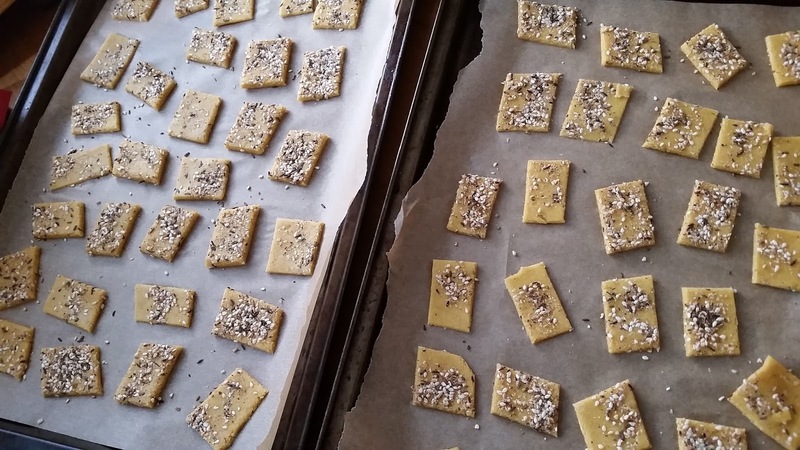 Place the crackers on two baking sheets. I've lined these with parchment for easy, compostable cleanup, but you probably don't need to. Make sure they're not touching. 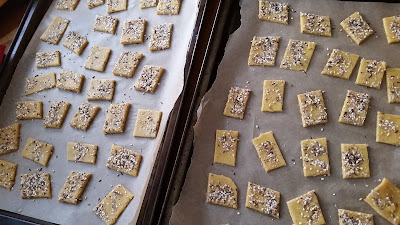 Put them in the 350 375 degree oven for 8 minutes to start, then remove and brush crackers with olive oil. 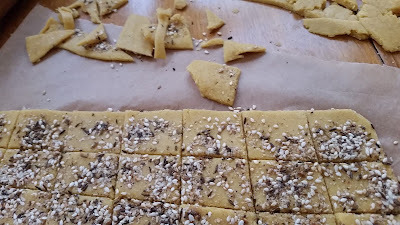 Sprinkle with a few grains of Maldon salt flakes per cracker (the salt is optional) and return them to the oven in the opposite position (switch the front to the back). 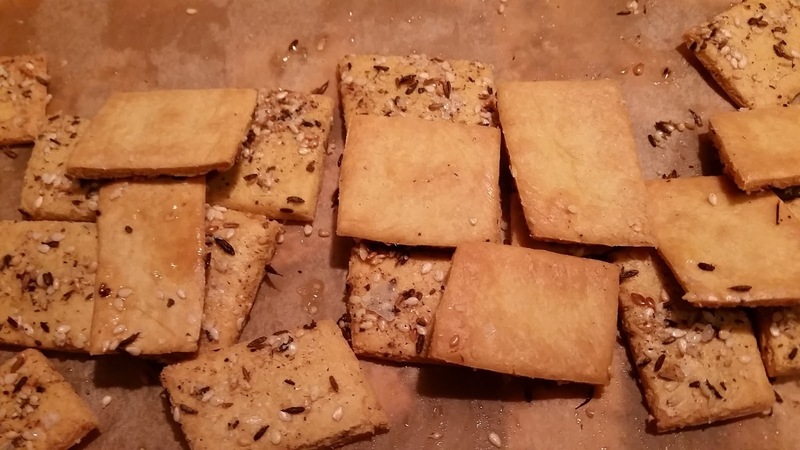 Bake for another 7-12 minutes depending on the size of your crackers. 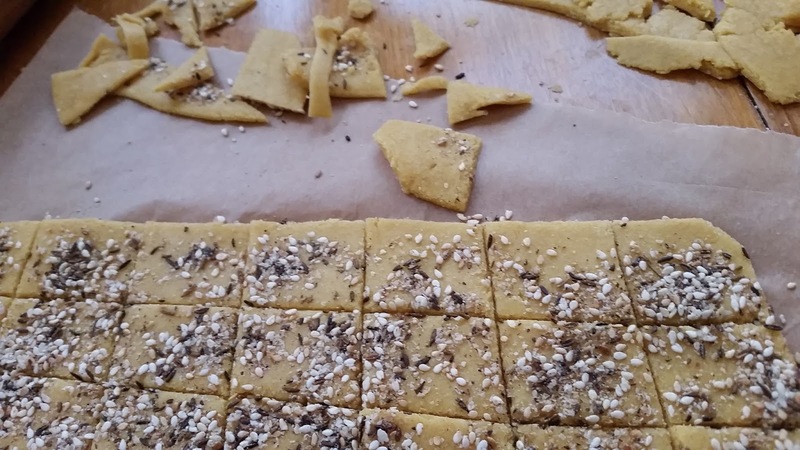 This shade of brown is just about perfect for crunchy crackers! 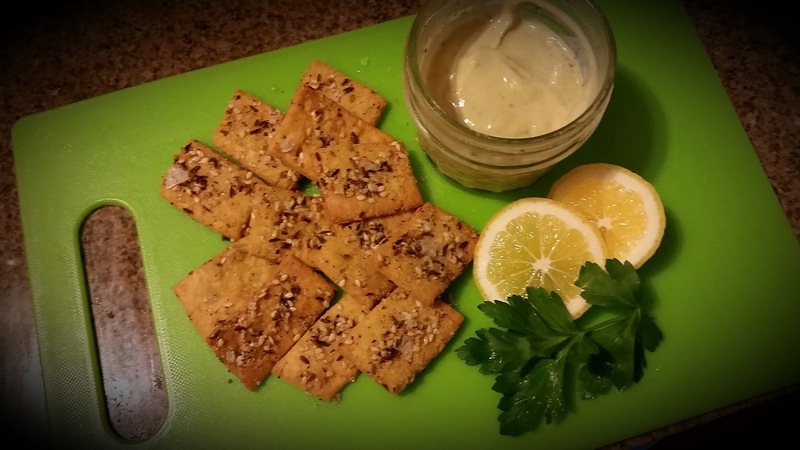 Serve with tahini sauce, hummus or whatever else strikes your fancy! To make a tahini sauce, start by blending 1/2 c tahini, 1/4 c olive oil, juice of one lemon, 1/4 c parsley leaves, one crushed, peeled clove of garlic and 1/2 tsp salt. Blend in 1 cup water, then taste and add more of whatever ingredients you feel are lacking.